Topic: Classic Movies to Watch with your kids. Re: Classic Movies to Watch with your kids. Classic Movies to Watch with your kids. Boss Llama wrote: My Google-Fu tells me that in mid-September they announced that there would be no community servers, and that even private practice sessions and such would have to be hosted through Blizzard official servers. Game companies really do seem to hate gamers. What is the upside for them doing this? Topic: Where were you born game. Re: Where were you born game. Very good. Cinematic in feel. Looking forward to the season finale. This and Humans both pleasantly surprised me. Have you unplugged and reseated you Memory/Video Card? Do you have a spare video card and PSU to see if it's either of those things? Topic: Dirt 3 - Help! 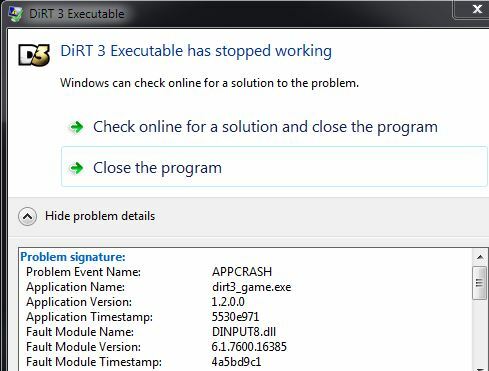 Re: Dirt 3 - Help! I use a Microsoft Sidewinder. I deleted the Intelipoint software and lo and behold, 8 races without a crash. You may have solved this! Eternal gratitude's. Here is the Error code. Completely random, can play for hours or it happens on start up. Same code each time. Game freezes, hit crt/alt/del, go into task manager and it lets me see the error screen and can close the game.